The Greek flag dates back to 1822, just after Greece declared its independence from the Ottoman Empire in 1821. On December 22, 1978, it was officially adopted as the sole national flag. The nine stripes are said to represent the number of syllables in the Greek phrase Eleutheria H Thanatos, usually translated as "Freedom or Death," which is a battle cry during the final revolt against the Ottoman Occupation. The color blue symbolizes the Mediterranean Sea, which is a major part of the country's economy and culture. Blue is also known as a color of protection, seen in the blue eye amulets used to ward off evil, and white is often considered the color of purity. Unlike most national flags, there is no official shade of color required. Any blue may be used for the flag, so you will see them ranging from a relatively pale baby blue to a deep navy blue. However, most flags tend to use a dark blue or royal blue. 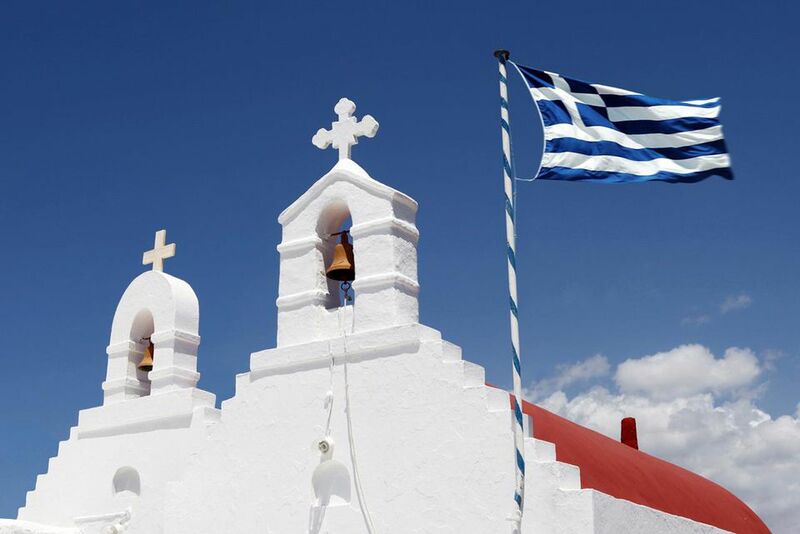 The nickname of the Greek flag is Galanolefci, meaning the "blue and white." This is similar to the way that the American flag is associated with red, white, and blue. There are many holidays when you can see the Greek flag fly from 8 a.m. to sunset. The three main days include: March 25, the anniversary of the Greek War of Independence; October 28 or Ohi Day, which is the anniversary of the refusal to accept Italian dictator Benito Mussolini's ultimatum during World War II; and November 17, otherwise known as Polytechnic Day. The flag can also be flown at half-mast on days of national mourning. At official government buildings in Greece, the European Union flag will often fly beside the Greek flag. The European Union flag is a deep blue with a circle of 12 gold stars to represent unity and peace across the continent. You may also see blue flags near Greece's pristine beaches. This flag—which has a blue background with a large white circle of waves inside—is awarded to beaches that meet special standards of sustainability and cleanliness. Why Is Greek Easter on a Date Different From Western Easter?